18 VDMA 2016 • VDMA MINING SUPPLEMENT Underground mining has continually evolved from a process that relied on brute strength and luck to mechanization and better reliability based on engineering. While underground mining techniques differ consider- ably by the nature of the formation and strength of the rock, the mines also have much in common, among others ventilation, getting salable minerals to the surface effectively, ever increasing travel times and a high concern for safety. German technology is prevalent throughout the mining chain and especially underground. Automated Driverless Rail Haulage Schalke manufactures highly sophisticated mining locomotives. The company recently sold locomotives to LKAB for the rail haulage system installed for the new level at the Kiruna iron ore mine in Sweden. The company has also sold locomotives to Codelco's El Teniente copper mine in Chile and Freeport's Grasberg block cave gold-copper mine in Indonesia. 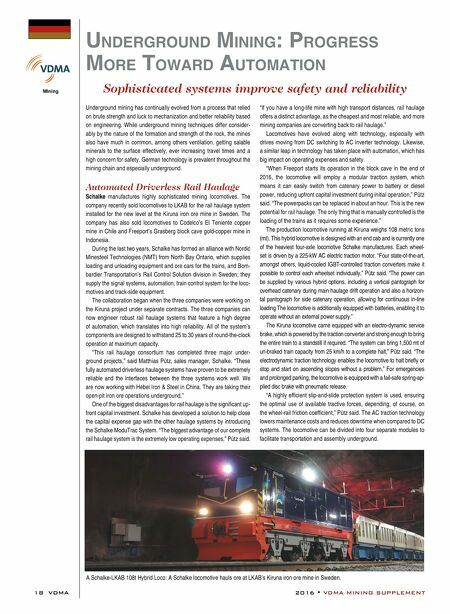 During the last two years, Schalke has formed an alliance with Nordic Minesteel Technologies (NMT) from North Bay Ontario, which supplies loading and unloading equipment and ore cars for the trains, and Bom- bardier Transportation's Rail Control Solution division in Sweden; they supply the signal systems, automation, train control system for the loco- motives and track-side equipment. The collaboration began when the three companies were working on the Kiruna project under separate contracts. The three companies can now engineer robust rail haulage systems that feature a high degree of automation, which translates into high reliability. All of the system's components are designed to withstand 25 to 30 years of round-the-clock operation at maximum capacity. "This rail haulage consortium has completed three major under- ground projects," said Matthias Pütz, sales manager, Schalke. "These fully automated driverless haulage systems have proven to be extremely reliable and the interfaces between the three systems work well. We are now working with Hebei Iron & Steel in China. They are taking their open-pit iron ore operations underground." One of the biggest disadvantages for rail haulage is the significant up- front capital investment. Schalke has developed a solution to help close the capital expense gap with the other haulage systems by introducing the Schalke ModuTrac System. "The biggest advantage of our complete rail haulage system is the extremely low operating expenses," Pütz said. "If you have a long-life mine with high transport distances, rail haulage offers a distinct advantage, as the cheapest and most reliable, and more mining companies are converting back to rail haulage." Locomotives have evolved along with technology, especially with drives moving from DC switching to AC inverter technology. Likewise, a similar leap in technology has taken place with automation, which has big impact on operating expenses and safety. "When Freeport starts its operation in the block cave in the end of 2016, the locomotive will employ a modular traction system, which means it can easily switch from catenary power to battery or diesel power, reducing upfront capital investment during initial operation," Pütz said. "The powerpacks can be replaced in about an hour. This is the new potential for rail haulage. The only thing that is manually controlled is the loading of the trains as it requires some experience." The production locomotive running at Kiruna weighs 108 metric tons (mt). This hybrid locomotive is designed with an end cab and is currently one of the heaviest four-axle locomotive Schalke manufactures. Each wheel- set is driven by a 225-kW AC electric traction motor. "Four state-of-the-art, amongst others, liquid-cooled IGBT-controlled traction converters make it possible to control each wheelset individually," Pütz said. "The power can be supplied by various hybrid options, including a vertical pantograph for overhead catenary during main haulage drift operation and also a horizon- tal pantograph for side catenary operation, allowing for continuous in-line loading The locomotive is additionally equipped with batteries, enabling it to operate without an external power supply." The Kiruna locomotive came equipped with an electro-dynamic service brake, which is powered by the traction converter and strong enough to bring the entire train to a standstill if required. "The system can bring 1,500 mt of un-braked train capacity from 25 km/h to a complete halt," Pütz said. "The electrodynamic traction technology enables the locomotive to halt briefly or stop and start on ascending slopes without a problem." For emergencies and prolonged parking, the locomotive is equipped with a fail-safe spring-ap- plied disc brake with pneumatic release. "A highly efficient slip-and-slide protection system is used, ensuring the optimal use of available tractive forces, depending, of course, on the wheel-rail friction coefficient," Pütz said. 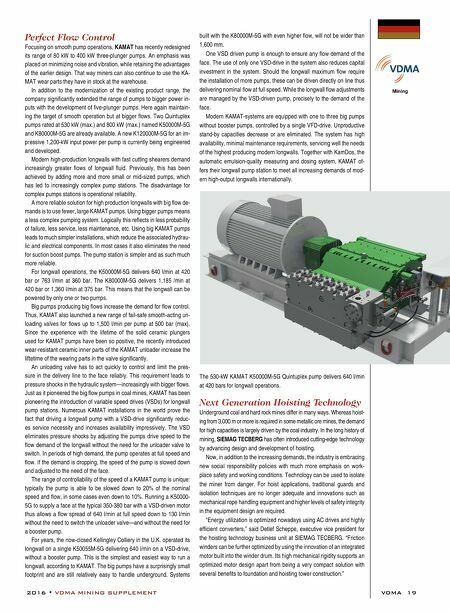 The AC traction technology lowers maintenance costs and reduces downtime when compared to DC systems. The locomotive can be divided into four separate modules to facilitate transportation and assembly underground. u nderground Mining: Progress More Toward a u T o M a T ion Sophisticated systems improve safety and reliability A Schalke-LKAB 108t Hybrid Loco: A Schalke locomotive hauls ore at LKAB's Kiruna iron ore mine in Sweden.